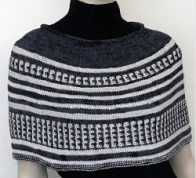 Every time I open Interweave Knits or Vogue Knitting magazines or look at the Twist Collective website I hope to see another design by Cathy Caron. 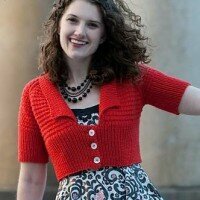 There is something about her designing style that makes me knit her patterns right away. Maybe because she is from a European background or because she is a New-Yorker, I can relate to her sense of fashion very well. 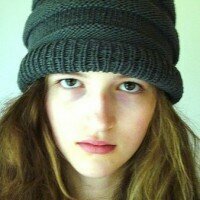 I also love hats and other accessories, so Cathy’s interesting constructions and styles are fascinating for me. 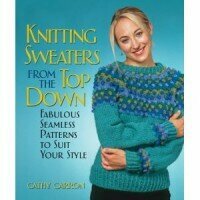 Cathy Caron is the author of three knitting books and a contributor to many knitting publications. 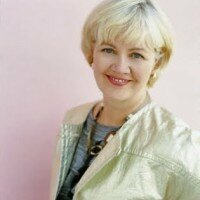 On her Ravelry page you will see that plus to her own books she has her designs in 12 books. Altogether there are 189 designs listed there. That’s quite a number considering that many of them appear in highly respected magazines. I am very pleased that Cathy was able to find some time in her very busy schedule to answer our 15 questions for this interview. This is a chance for us to get to know Cathy Caron better. I started around 10 years of age. My Latvian grandmother taught me how to knit in the Continental fashion, however I only learned the knit stitch from her as she had a stroke soon after which it left her paralyzed on the right side. I taught myself to purl reading books, but as it turns out I was making a ‘twisted purl’ stitch, which in some sense was okay as I was consistent is doing so. However, when I was around 12, our family assisted a Slovenian family in emigrating to the USA and it was the wife, Naca, who corrected my purling. 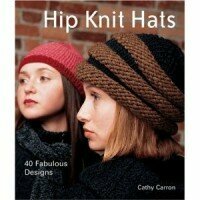 Although I have knitted for decades, it wasn’t until 2005 when my book Hip Knit Hats appeared. It was inadvertent to say the least. In the mid-1990’s I was living in London (my husband has been transferred for his job) and I began to research ‘knitting for the military’ – a subject near-and-dear to my heart. I spent two years researching and another 2 years writing. While looking for a publisher I began to knit hats to fit my large head and became transfixed with design. When we returned to the States in 1996, I called Classic Elite Yarns to ask them if they were interested in hat patterns; quite honestly I don’t know what possessed me to do so. The designer director at the time told me that they did not publish but that the owner, Pat Chew wanted to see what I had anyway. To make a long story short, she promised me that she’d find a publisher for my work and she did. And so my publishing life began. The moral of the story perhaps is that solid design speaks loudly?! For me it is an imperative to knit creating the least seams possible as I think ‘finishing’ a garment does the hardiest souls in. So I am a top-down knitter. However, I don’t limit myself either and will experiment to achieve whatever desired effect I am seeking to create. I think about design and ‘the new’ constantly’, I am insatiable. I am always seeking out new ways of rendering form. I think most knitters are enthralled with ‘surface design’ – intarsia, stitchery, coloration, etc. which is all well and good, but the new territory to explore is in ‘form’. Form is tough, as it’s not obvious and the possibilities are infinite. As for inspiration – it all depends on what I am trying to achieve. I love to be given a ball of yarn and ask to do something…the yarn says so much about form and elasticity; the yarn tells you what is possible as clearly things are possible in wool that aren’t in linen and visa-a-versa. As for garments, the neckline shaping is key and that’s often the jumping off point for me. Innovation in designing best occurs when there is a constraint, so that you are forced to problem solve. Admittedly, I have an amazing space to work in…but mind you I am no spring-chicken and for years I worked wherever there was a chair and that was often at the dining room table. About 3 years ago, my husband and I purchased a one-bedroom apartment in our building on the Upper Westside of New York City. We live on the 11th floor and the apt – now my studio – is on the 4th floor. It took a year to renovate it; the interior is painted linen white, the accent color in the work space is a cherry red – the chairs, picture frames, accessories – very cheery. It’s unbelievably fabulous to have my own space, something that I have wanted since childhood. After I do my morning chores, I immediately scoot downstairs and begin my day. I can make any sort of mess I want – and I make messes with beads and yarn and ribbon and stuff – and I don’t have to tidy anything or move anything for anybody. And I can leave my work to run back upstairs to make dinner, meet my daughter as she arrives home from school, only to run back downstairs after dinner. It is totally and completely blissful. My studio is also at the back of the building so I don’t get any street noise – it’s extremely quiet so I can think and work. For music, I’ve adopted an old boom-box that one of my daughters discarded – I play Duffy, classical, show tunes, whatever. My hubby has to be given a pat-on-the-back for helping me realize this dream…but I bet he was glad to have my creative musings on another floor as well! I am not in touch with other designers per se – if I am in touch with anyone it’s with the staffs of the knitting magazines and my publisher (Sixth & Spring / Vogue Knitting). Occasionally, I get asked to contribute to projects. I have no ‘knitters’ – I do all my own knitting; Although for the first time members of the staff of Sixth & Spring are knitting some of my designs for my forthcoming book (Fall 2010) because of time constraints. We have 40 projects to do in 3 months! 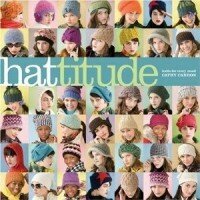 I have three books out – Hip Knit Hats (2005), Knitting From the Top-Down (2007), Hattitude (2009) and a fourth book for the Fall 2010. In the past my work has been published in Vogue Knitting, Interweave Knits, Knit Simple, Knit.1, knitscene, Rowan magazine and All You. I have also contributed projects to a half dozen books. Occasionally, I have taught classes at my local yarn shop in Washington, CT – The Village Sheep – but as of late I have done little or no teaching as designing takes all my time. Have no fear – be brave – jump in – cast on. At the moment I am working furiously and with haste on another book on ‘neck gear’ due out Fall 2010 for Sixth & Spring. I also get ideas for garments and love to pitch the magazines when I can. For the long term, I would love to get my military knitting history published and plan to have another look at that manuscript next summer after my youngest decides on college. I also have other book ideas some related to knitting and a few not! I’d love to entertain doing work for a yarn company. I never reveal what I am working on at moment as it would be taking-the-wind-out-of-the-sails of the good people that publish my designs. However, perhaps I can offer a few thoughts on what I would like to explore going forward be it commercial or not: there are many garment shapes, especially necklines which I would like to explore; I would like to design a scrumptious mohair coat; I am very interested in exploring alternative materials and I just love using and designing with ‘scraps’ (stash? ); Of course, exploring ‘form’ is a never-ending quest and I wouldn’t mind delving into ‘art knitting’ someday, although I am not sure I will get there as I find garment and hat design continually mesmerizing. I often think that if a lull arose in my ideas that I would branch out, but so far I have a laundry list to do! FG: Cathy left this question open, so I took the liberty to copy her words from Ravelry. Knitting is a passion. I am continually experimenting with top-down design and seamless knitting. I love classic knitting and styles – what’s not to like – but I am more intrigued by new approaches to shaping and design. FG: I want to thank you, Cathy, for this great interview. It was very interesting to learn how you work as a designer. Good luck with your upcoming books. I know I will be looking forward to them.